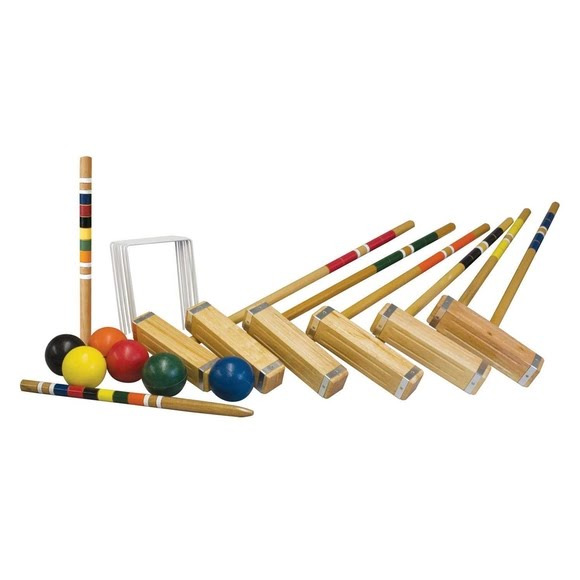 Step your croquet game up to the next level with Franklin's Advanced 6 Person Croquet Set. This storied outdoor game set includes six all-weather molded balls, six mallet handles and heads lacquered with a chestnut finish, two painted wood stakes, nine all-weather coated wickets plus a deluxe carrying bag to keep it all organized and compactly stored. Step your croquet game up to the next level with Franklin&apos;s Advanced 6 Person Croquet Set. This storied outdoor game set includes six all-weather molded balls, six mallet handles and heads lacquered with a chestnut finish, two painted wood stakes, nine all-weather coated wickets plus a deluxe carrying bag to keep it all organized and compactly stored. Whether you&apos;ve been playing croquet for years or are trying to pick it up again, this advanced set has everything you need to start navigating your way through the wickets today.